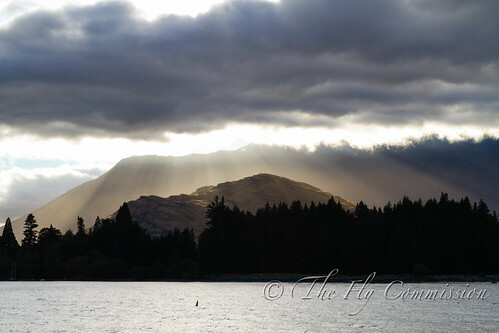 Queenstown is known for many things; the adventure capital of the world, the home of commercial bungy jumping, whitewater rafting, mountain biking, burgers… you name it, they’ve got it on some sort of impressive scale. The other thing I am fairly familiar with in Queenstown is late starts due to the night before and that’s exactly what we came across. I don’t particularly mind late starts (ask Craig!) but it did mean reshuffling our plans for that day somewhat significantly. What we saw of the morning was gorgeous though. We settled on the upper reaches of a river as there were a few other anglers out on the water lower down. On this day we decided to fish separately as the fish population in this water doesn’t warrant the need for two pairs of spotting eyes. Craig went off upstream and I walked downstream from the car. 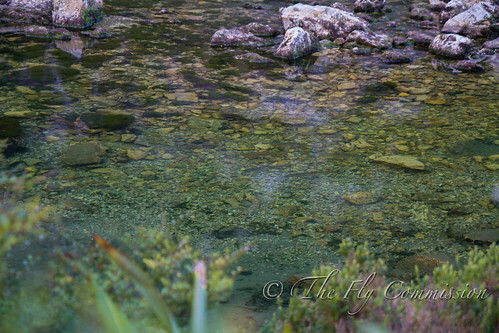 The very first pool I came to had two fish cruising around in a totally slack backwater but neither of them seemed remotely interested, in fact, they showed a disgraceful lack of etiquette and plainly ignored my flies. Just in front of these two there was a fish feeding hard in the middle of the stream. I covered it lord knows how many times with different nymphs to absolutely no avail. To vary the drift I tried different angles and lengths of approach but none were good enough for this fish and he wouldn’t even spook. 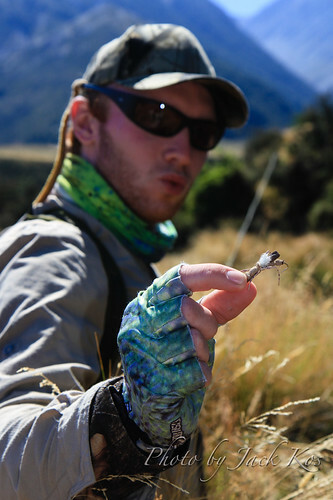 Big streamers, cicadas, slap downs… the ultimate impossible fish. Eventually it wound me up enough that I walked up to it just to settle my mind that it was actually a live fish and not a rubber one some evil genius had planted mid stream! It spooked and I therefore was able to take solace in the fact it was just me that couldn’t catch it! With the humiliation of the first three fish pushed firmly to the back of my mind, it was onwards upstream to find some more fish. That didn’t take long at all with just about every overhanging willow tree harbouring a trout behind it hoovering up the miniscule willow grubs as they plopped off from the leaves. I almost feel embarrassed to admit this seeing as I’ve spent so long in NZ but this was the first time I’d ever given willow grubbing a real shot and boy was I glad that I’d bought 2 willow grubs from Stu’s Fly Shop earlier that morning!! It was such good fun. The fish were going absolutely bananas, sipping furiously gorging on these tiny morsels. This might sound easy, right? Well, there is a catch. The catch is that most casts have to get very close to the willows, sometimes underneath, the fish are feeding on a huge number of naturals so you have to be deadly accurate and when you do hook them they bolt straight for the willow roots. When you bring it all together though it is down right superb fishing. 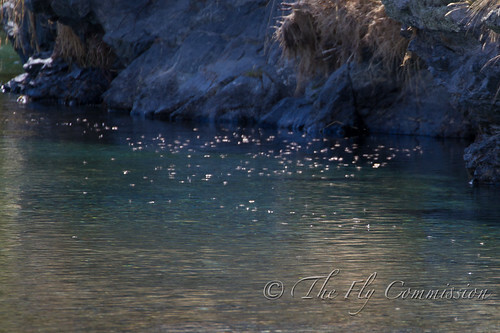 Getting your fly into a seemingly impossible lie and watching the trout happily sip in your fly is just brilliant, it’s dry fly fishing at its finest. It’s very technical. 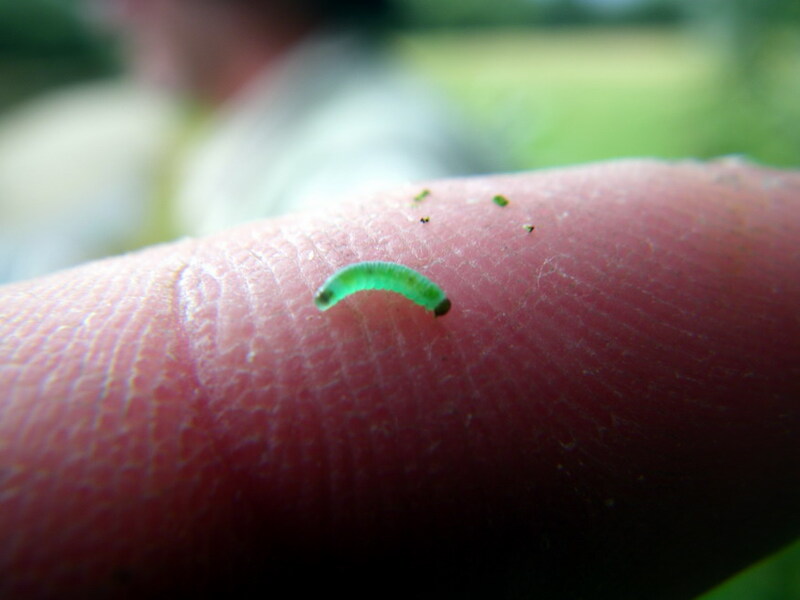 Chris has a great explanation of willow grub fishing on his website, check it out. The video below is what’s known in the trade as a classic f*ck up. Never let the fish get into the willows!! No idea what I was thinking! When we got back to the car we compared notes and it seems we both had very similar days, a number landed but completely outweighed by lots of hooked and lost fish but great fun. 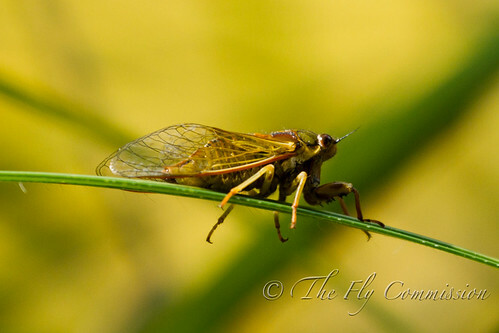 I managed a 4lb mayfly feeder to the side of the main current of a run just below the car to top off a fine day. 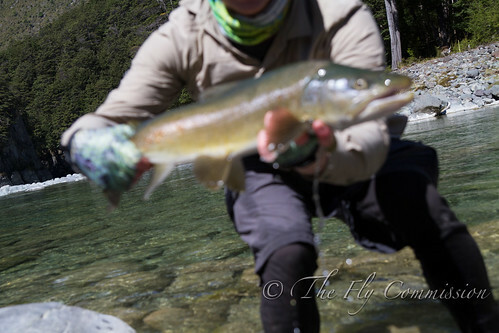 The following day we fished our original intended river and again split up. I fished up one section of the river new to me whilst Craig fished higher upstream and into a tributary. The very first pool I came to again held a fish but this time he was rising. One cast with a big turks tarantula, up he came and lo and behold yours truly missed it. 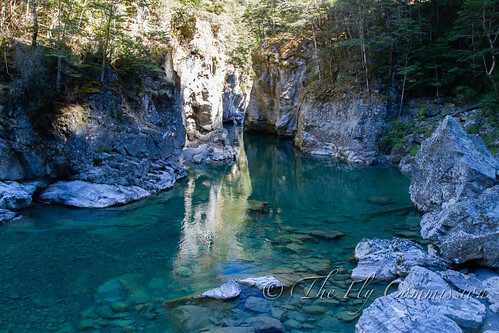 A few swear words were quietly muttered so you can imagine my surprised when they echoed rather impressively in the gorge! After that I managed a few brown on the tarantula before losing the dam thing to a rock wall. There was some fairly serious climbing involved to get to the spot I was fishing from so going back for a fly was just not an attractive option. 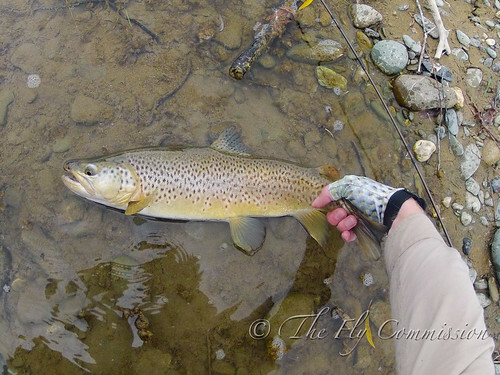 I managed a few more browns and a nice 5lb bow on a fat albert, an awesomely ugly fly that is so effective. Unfortunately most of the footage of these was on the go-pro which was lost later that same day, very annoying. The next day was a write off with me up early to try and find the camera and Craig having a sleep in. I didn’t find the camera and that lucky bugger got a lie in! As usual a last minute plan was hatched with impeccable precision for the last fishing trip together. A remote river was chosen, the weather forecast checked, some beers and food bought (note the order of importance) and we were good to go. The weather over the course of this summer’s fishing has been absolutely phenomenal. I have seen 2 days of rain since leaving the UK on the 14th of January and one of those days was in Auckland so that doesn’t count in fishing terms! The negative impact of this is that most of the rivers are getting very, very low. There have been fish kills in Canterbury and most of the Southland rivers were on their bare bones when we were last down there. This had a very obvious effect on the fishing, making it that bit harder and there being a noticeable decrease in spotted fish. It could be that a lot of fish have been dropping back into the lakes searching for deeper and more oxygenated water. 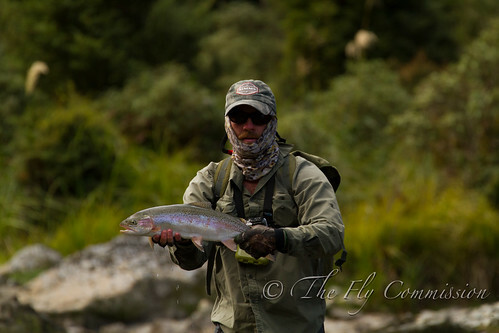 Even with the poor water conditions we spotted plenty of fish and got some fairly great dry fly action still. This brown was probably my favourite fish of the trip. Not because it was the biggest or nicest looking but simply because it was the hardest to catch. I could only cast from one position, thigh deep in soft silt. There were bushes behind me allowing just enough space to get a straight cast in the direction of the fish but there was a log snag standing proud of the water in front of me directly behind the fish about 3′ downstream. 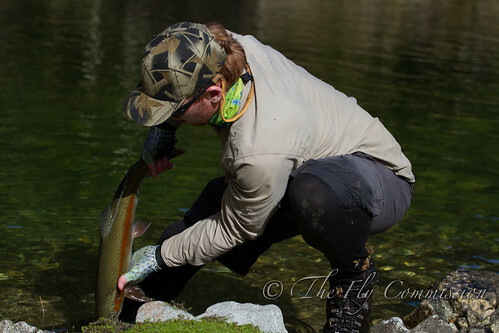 Due to my casting position I had two options – cast straight and try to mend around the snag or try and overpower the cast from the side and curve it. It was windy but I gave the mend a shot first. I managed to not snag and get the fly in front of the fish but it dragged slightly and was ignored. Next time I tried the overpowered curve, it worked but the fly was nowhere near the fish. Third cast lucky and the planets aligned for me so to speak. The cast landed good and the fly came down nicely without any perceptible drag. 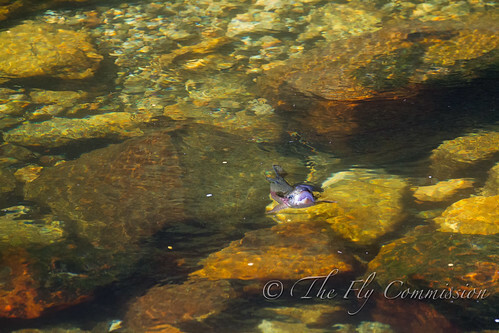 It seemed an absolutely age before the fish moved, allowing the fly to get down and opposite before moving for it. 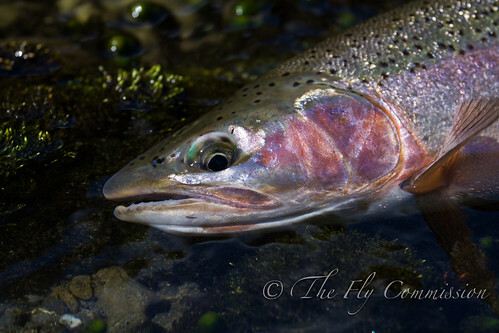 Thankfully the fish sipped down a size 18 parachute adams (what a fly!) and I struck into a solid connection. Very satisfying. We witnessed a fairly special sight on the river too finding one little pool holding about ten rainbows all probably 4lb plus. It was great to see albeit I only managed one of the fish before they all became too jittery. It was special but check out these sea runners from Ronan!! This was the last trip we had together before Craig had to jump on a metal bird bound for the UK. 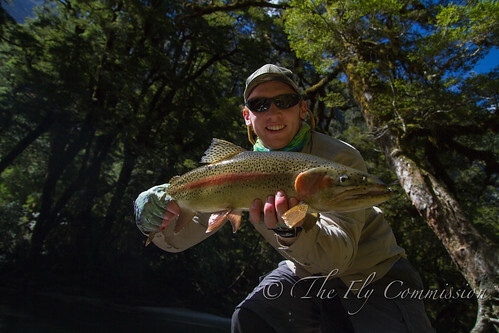 We lost loads of fish as per for turbo-charged rainbows and lots of snags but the ones we did land were nice fish. The light conditions never really played ball being overcast all the time but 2 months of sunshine and no cloud couldn’t last for ever! 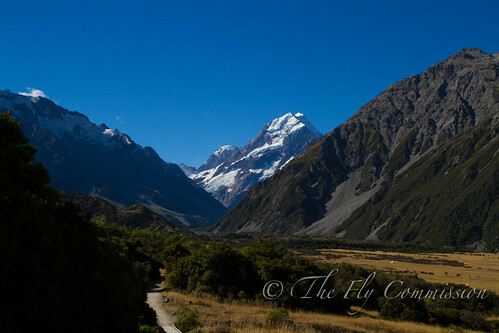 The next day was just a travel day so we stopped off at Mount Cook for a look around on the drive back to Christchurch where Craig dropped me off and I met up with Jack Kos. Jack and I had a fairly tough day actually trying to find fishable water! We started on a large braided river which was very low but yielded a few small rainbows for Jack with me recording an impressive score of one missed. Later in the day Jack found us a couple fish that were feeding hard. The first fish was feeding harder than any fish I’ve ever seen, it was all over the inflow current to a pool, hoovering down the naturals and there were plenty of them! I don’t know how many times I cast at this fish before he took it but Jack reckons in that period the fish probably rose 50 times. We’ve got some pretty nice footage of that one, it was just nuts! 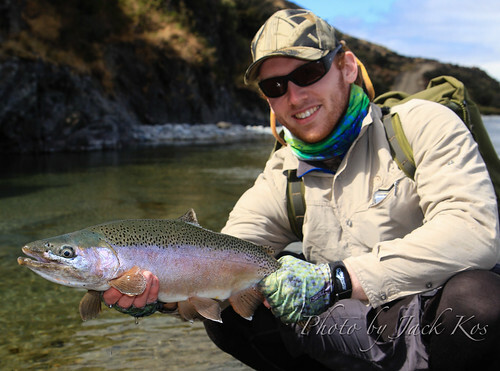 Have a look at the green spot on Jack’s rainbow, what a lovely fish. The last fish we found was sitting tight under a bush with no direct way of casting over it. I swung a nymph past the bush as closely as I could but after two attempts with no response it was time to change tactics. Jack reckoned something big. I reckoned that meant a fat albert was needed! One cast near the bush and the fish flew up from under the bush, across the fly, I struck and connected with thin air. Think I was too fast on the strike but it makes for good miss footage! Was a real gutter as it would have been a great fish to get, to win the challenge with the difficult lie but some things just aren’t to be. 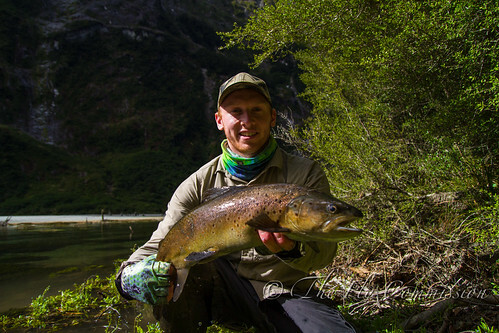 I’ve finished up fishing in New Zealand now, in fact, I’m sitting in Christchurch airport waiting on my flight over to Melbourne. I haven’t fished in the last week rather spending it just catching up with friends which has been a lot of fun. It’s great to meet up with old mates you haven’t seen in a while and visit old places you know so well, mainly pubs of course! It’s been a great couple months and whilst I can’t wait to fish Tassie shortly and get up to Exmouth to chase big saltwater species there’s definitely a part of me that doesn’t want to be leaving. I guess that just means I’ll be back. Top class report and photos again Scott. Really enjoyed your reports and the photo’s too. Look forward to hearing about your adventures in Tassie. 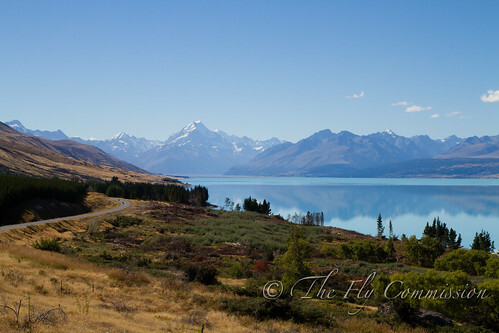 Really enjoyed following your reports from NZ Scott. Hope your next adventure in Tassie goes well and look forward to hearing about it. 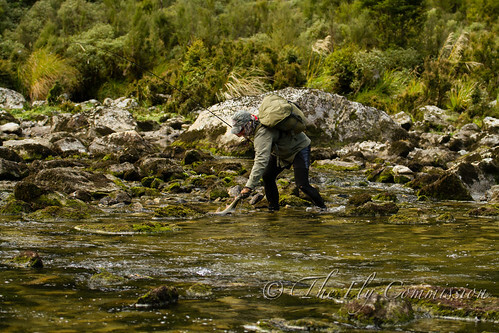 Fishing has been incredibly tough in Tassie, very very difficult. At this stage there won’t be any long fish reports but rather a tale of brutal conditions!